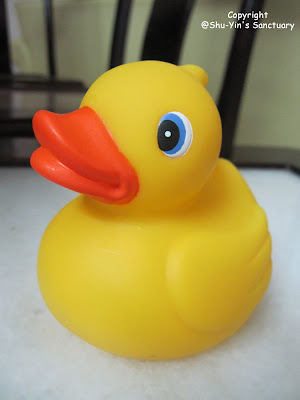 Min bought Shern his first bathing toy - a yellow ducky. She bought it from the Chowrasta market for only RM2. Wll, the colour is very bright yellow and is very pleasing to the eye. However, when we put the ducky into the tub with Shern, he doesn't know how to play with it yet....guess he is still too young. Anyway, this yellow ducky squeaks too when it's squeezed - but is a 'lil too loud and too high-pitch. I must remember never to squeeze it too near his ears.